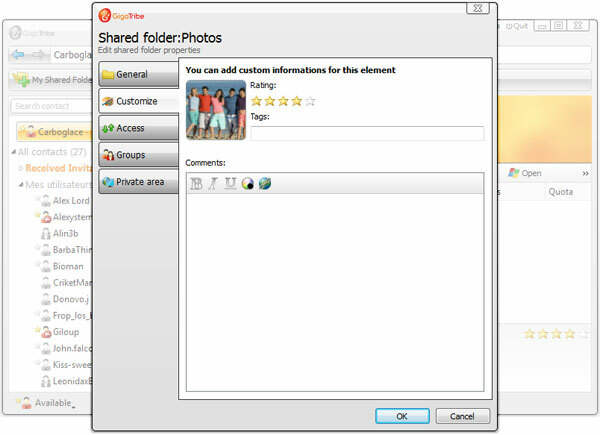 GigaTribe is community software already employed by more than 1 million users for sharing files privately over the Internet. 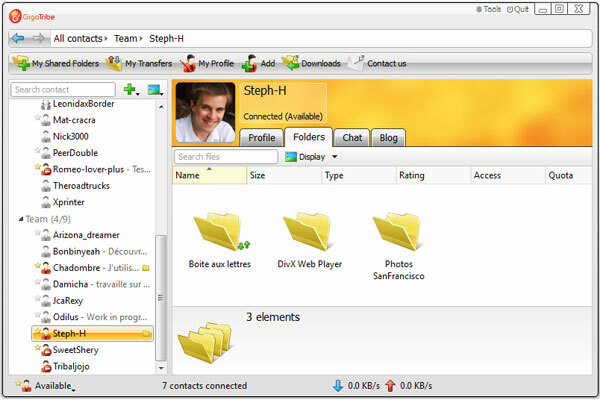 The software interface is divided into two windows. - The left window contains a list of all your contacts: your private network. Once you've selected a contact you can browse their shared folders as if you were on your own computer. You can then download any file you want. When launching GigaTribe for the first time the contact list is empty. So the first thing you need to do is to invite your friends to join. Your friends need to install GigaTribe and create a user name. There are many ways to invite friends to join your private network. * Find people you know on GigaTribe. 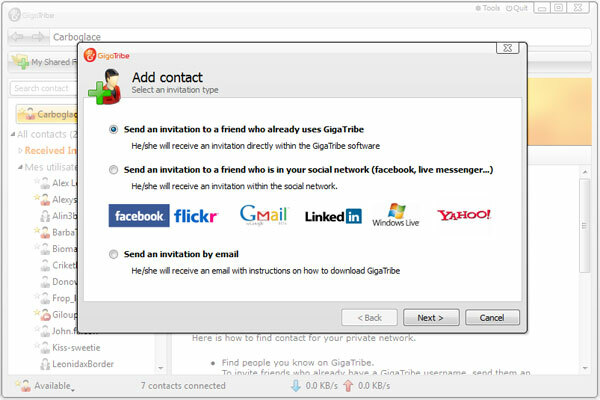 To invite friends who already have a GigaTribe username and send them an invitation request from the software. To invite friends who don't have a GigaTribe username yet, send them an email from the software. * Find people you know on other networks. If you have friends on the social networks (facebook, msn,...) send them an invitation through those networks. Join the facebook group: GigaTribe official Facebook community to meet people already using GigaTribe. OR Launch GigaRoulette to make new friends! Select the folders you whish to share with your contacts in your private network. You do not need to copy or upload your files, just 'tag' your local hard drive folders to share them with GigaTribe. Once you've selected which folders you want to share, the contents of those folders are instantly accessible to your friends. Any addition or modification within the folder will be immediately available to your friends. Photos and videos are downloaded in their original format. You let your friends download the files they like but you keep the control. You can browse any folder shared by your contacts and download any shared file. If a download is interrupted, the transfer automatically resumes with no loss of data. You can monitor all the files exchanged from the transfer window. You may decide to pause or cancel any download. Since you have a direct and secure access to your friend's hard drive your download speed will be as fast as your friend's upload speed. With the Ultimate version you will download faster!